Spies Travel in Copenhagen has launched the second “Do It For Denmark” advertising campaign linking travel to warm locations with a solution to Denmark’s low birth rate. The first campaign, run in March 2014, encouraged Danes to enter a competition involving travel and conception. Vitus, the baby conceived by the competition-winners was born in January this year. Now Spies Travel introduces Spies Parent Purchase™ in which parents can send their adult children on an active holiday and get a grandchild. 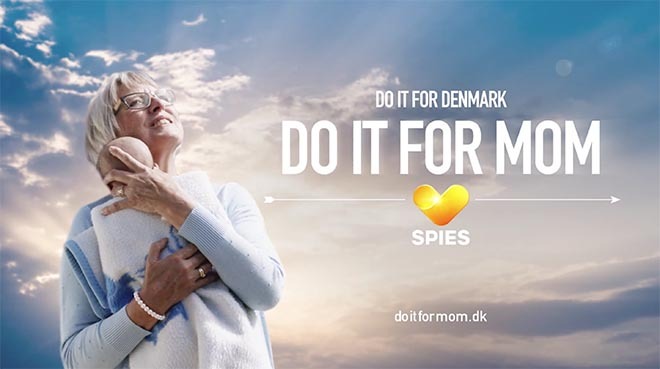 The Do It For Mom deal is online at spies.dk/do-it-for-mom. The Do It For Denmark 2015 campaign includes a set of six exercise videos encouraging couples to build their stamina together: The Pump, The Crane, The Key, The Ramp, The Spring, and The Magnet. The Spies Travel Do it for Denmark campaign was developed at Robert Boisen & Like-minded by strategist Søren Christensen, creative director Heinrich Vejlgaard, art director René Sohn Kammersgaard, and account manager Gitte Andersen. Filming was shot by director Niels Nørløv via Gobsmack Productions with executive producer Christina Bostofte Erritzøe, producer Cille Silverwood-Cope, director of photography Bastian Schist, editor Simon Borch, VFX artist Magnús Sveinn Jansson. Sound was designed by Lars Bo Kjar at Audio Lounge. The campaign site was developed at Molamil by creative director Joakim Norman, interactive developer Ramiro Espada and project manager Jakob Elm. Media was handled at Be On – AOL Platforms by Nordic account manager Rasmus Mikkelsen and senior campaign manager Louise Brogaard. PR was handled by Radius Communication by account director Mads Bech Larsen and consultant Cecilie Valentin.